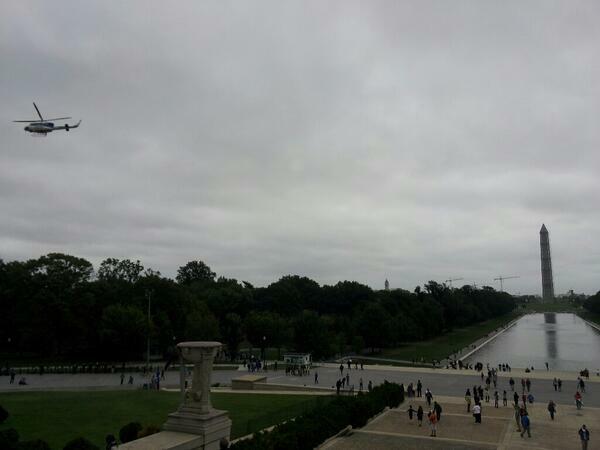 It is a helicopter hovering over the veterans protesting the barricading of the National Mall. The veterans took down the barricades and carried them to the White House, where they left them outside the gates on the lawn. It costs around $15,000 per hour to keep a helicopter in the air. As a reminder, the government is still shutdown and “non-essential” services are still unavailable. Apparently monitoring veterans with a helicopter is an “essential” function. The National Mall is an open area. The cost of maintaining the Mall is the cost of picking up the trash and mowing the lawn. Neither of these activities approaches $15,000 a month, much less $15,000 an hour. The closing of the Mall is an attack on the freedom of Americans. It is only one example of the government doing things to inconvenience Americans for political reasons. While World War II veterans are being denied access to their own monument, Camp David is open to the Vice-President and his family for a vacation. The political class should not be given special treatment while American citizens suffer because of their decisions. The National Mall in Washington is closed, the World War II Memorial is barricaded, the Vietnam Memorial is closed, and other monuments are blocked off. However, if your politics agrees with the politics of the Obama Administration, you have access to the closed Mall. Susana Flores, a spokesperson for the rally (“Camino Americano: March for Immigration Reform“), confirmed for the Washington Examiner that the Park Service will allow the event to take place under the group’s rights granted by the First Amendment. What about the rights of the businessmen the Park Service has closed or the elderly couple the Park Service evicted from their houseboat on Lake Mead? This is politics at its worst. We need to remember this in November 2014. The problem here is not the shutdown–we have had shutdowns before–the problem is the war on the American public by the government. The Obama Administration loves to pick winners and losers. In this battle the losers are the American public. We need to vote anyone out of office who took part in this war on Americans. Reuters reported on Friday that a “Million Muppet March” is being planned for November 3 at the National Mall in Washington, D.C. The event is a response to Presidential Candidate Mitt Romney‘s statement that he loves Big Bird, but it is time to stop subsidizing PBS with taxpayer money. The implication is that it is time to kick Big Bird out of the public nest. I like Big Bird too, but enough is enough. If Dora the Explorer can survive without public assistance, why can’t Big Bird? Do you know how many “Tickle-Me Elmo‘s” I have bought for my grandchildren? How many Sesame Street books? Sesame Street coloring books? I realize that Public Broadcasting is more than Sesame Street, but it seems that with an income generator like Sesame Street, it ought to be easy to make Public Broadcasting profitable. What about the fund raisers they do throughout the year? I understand that ‘they do not do commercials,’ but what about all the names mentioned of contributors in between shows? Anyway, I hope those supporting Big Bird have a happy march. I also hope that someone comes up with a few ideas on some small places to cut the federal budget. If we can’t make little budget cuts, how will we ever make big ones?